The story continues from The Hunger Games: Mockingjay – Part 1 with Katniss Everdeen (Jennifer Lawrence) preparing to win the war against President Snow (Donald Sutherland) and the tyrannical Capitol. Together with Peeta, Gale, Finnick, and others she travels to the Capitol to kill Snow. However, President Coin (Julianne Moore), the leader of District 13 and the rebellion, hides a bigger agenda that could not only jeopardize Katniss' life, but the future of Panem. Mockingjay – Part 2 was released on November 20, 2015 in the United States, in 2D and IMAX, and internationally in 2D, 3D, RealD Cinema, and IMAX 3D in select territories; it is the only film in the series widely released in 3D. Falling below expectations internationally and domestically with a $102.7 million gross during its opening weekend in North America, the film had the sixth-biggest opening in 2015, but held at number one at the international box office for four consecutive weekends. The film grossed over $653 million worldwide, making it the ninth highest-grossing film of 2015 and the lowest-grossing of the four films in the franchise, but still a commercial success. Part 2 received generally positive reviews from critics, for its performances (particularly Lawrence and Hutcherson's), screenplay, musical score and action sequences, though it was criticized for splitting the final adaptation into two separate parts. The film was nominated for Best Fantasy Film at the 42nd Saturn Awards. For her part, Jennifer Lawrence was awarded as the Favorite Movie Actress at the 2016 Kids' Choice Awards and Best Hero at the 2016 MTV Movie Awards. Katniss Everdeen is recovering after being attacked by Peeta Mellark, who has been brainwashed by the Capitol. President Coin allows Katniss to join an assault on a mountain in District 2 housing the Capitol's main armory and air force. District 13's air force launches a bombing, burying the Peacekeepers but freeing numerous civilians. Although Katniss convinces the survivors to join the rebellion, she is shot by one, surviving with a bruised lung thanks to her bulletproof Mockingjay suit. Coin will not let Katniss join the assault on the Capitol, protecting her as a symbol. At the wedding of Finnick Odair and Annie Cresta, Katniss is informed by Johanna Mason of a supply craft leaving for the Capitol. Coin has her assigned to the "Star Squad", which is led by Boggs and includes Gale, amongst others. They will follow in relative safety behind the actual invasion force, providing video for propaganda purposes. Boggs carries a holographic map (the "Holo") to help them evade known booby-trapped "pods", which line the streets. Coin also sends a not-fully-recovered Peeta to join the squad. Boggs is fatally wounded, giving the Holo to Katniss before dying. The squad triggers another pod which releases a flood of lethal black tar. Peeta momentarily succumbs to his conditioning and attacks Katniss, killing Mitchell in the process. Star Squad takes shelter in an abandoned building, where Jackson demands the Holo, until Katniss says that she is under secret orders from Coin to kill Snow. When a squad of Peacekeepers destroy their hideout, Star Squad escapes, but the Leeg twins are killed. The Capitol then broadcasts a message by Caesar Flickerman reporting Katniss's death and Snow denouncing the rebellion, which is interrupted by Coin, whose impassioned eulogy rallies the rebels. Star Squad takes to the sewers to avoid the Peacekeepers, but the group is detected and Snow sends a pack of genetically engineered "mutts" to ambush them. Jackson, Castor, and Homes are killed, then as Finnick sacrifices himself to allow the rest of the team to escape. Katniss sets the Holo's self-destruct, killing the remaining mutts, and Finnick to give him a merciful death. Messalla is vaporized by a pod., before the diminished Star Squad exits the sewer. They take refuge in a shop, where Tigris, a former Hunger Games stylist, hides them. As rebel forces advance, Snow invites Capitol citizens into his mansion in the city's center for protection, in the process forming a human shield. Katniss and Gale join the crowd, posing as refugees. Peacekeepers herd Capitol children toward the palace gates, when a hovercraft with a Capitol insignia flies overhead and drops small bombs, causing mass casualties. The rebels’ team of medics, including Katniss's sister Prim, attempt to help the injured, when a second wave of bombs detonate, killing Prim and knocking Katniss unconscious. Katniss revives and learns the rebels have won. She confronts a captured Snow, who explains that Coin staged the bombing as a means of turning the last of Snow's soldiers against him. Katniss realizes the attack does match a strategy Gale had suggested earlier to inflict maximum casualties on medics, and is stunned when Gale cannot deny his part in the death of Prim. Coin invites the surviving Hunger Games victors to a meeting, where she declares herself the interim President of Panem and asks the victors to vote for a last Hunger Games using the children of Capitol leaders. Peeta, Beetee and Annie denounce the idea, while Johanna and Enobaria side with Coin. Katniss votes yes in exchange for the right to execute Snow herself. Haymitch sides with Katniss, figuring she has a good reason. At the execution, Katniss kills Coin instead, causing a riot. Peeta stops her from taking suicide pills, and Katniss is arrested while witnessing enraged rebels beat Snow to death. In captivity, Katniss receives a letter from Plutarch and is assured that she will eventually be pardoned, and will be able to return to District 12 once the dissension quiets. In District 12 she is joined by Peeta, who has recovered from his conditioning. Commander Paylor is elected the new President of Panem, Katniss is pardoned for Coin's killing, and bonds with Haymitch and Peeta over their shared trauma. Years later, Katniss and Peeta play with their two children. In addition to these 20 top-billed cast, Stef Dawson returned for her third appearance as Annie Cresta, Paula Malcomson for her fourth appearance as Katniss’ Mother, Eugenie Bondurant as Tigris, twins Misty and Kim Ormiston as Leeg 1 and Leeg 2, while Jennifer Lawrence’s nephews, Theodore and Bear Lawrence, appear briefly as Katniss and Peeta’s children. On July 10, 2012, Lionsgate announced that the film adaptation of Mockingjay would be split into two parts; The Hunger Games: Mockingjay – Part 1, released on November 21, 2014, and The Hunger Games: Mockingjay – Part 2, released November 20, 2015. On November 1, 2012, Francis Lawrence, director of The Hunger Games: Catching Fire, announced that he would return to direct both final films in the series. Talking about direction for last two parts Francis explains, "I felt a different kind of pressure," he explains. "[On 'The Hunger Games: Catching Fire'], I had to prove myself a little bit as the new guy in the game. It was a relief that it was received well by the fans. Even though I was relieved, it was only momentary; it sort of set the bar higher for the next one!." On December 6, 2012, Danny Strong announced that he would write the third and fourth films. On February 15, 2013, Lionsgate approved the script for Part 1 and gave Strong permission to write that of Part 2. In August, Hemsworth confirmed that shooting of the film would begin the following month. The film's production began on September 16, 2013, in Boston, Atlanta, and Los Angeles. Studio Babelsberg co-produced and oversaw production services for the film. On November 13, 2013, producer Nina Jacobson revealed that Peter Craig was also hired to write the adaptations. The film carried a production budget of $160 million with a further $55 million spent on promotion and advertisements, and $13.9 million in television advertisements. 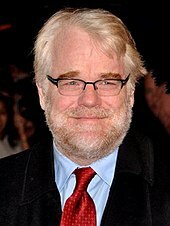 Philip Seymour Hoffman plays Plutarch Heavensbee in his final appearance before his death in 2014. All the principal cast such as Jennifer Lawrence as Katniss, Josh Hutcherson as Peeta, Liam Hemsworth as Gale, Woody Harrelson as Haymitch, Donald Sutherland as President Snow, Elizabeth Banks as Effie, Willow Shields as Prim, Paula Malcomson as Katniss’ mother and Stanley Tucci as Caesar, return to reprise their roles. Julianne Moore also returned to reprise her role as President Alma Coin, along with Philip Seymour Hoffman, who died during the filming in February 2014, as Plutarch. He had nearly completed his scenes, and his two remaining scenes were rewritten to compensate for his absence. Regarding Hoffman's scenes, Lawrence commented that, "He had two substantial scenes left and the rest were appearances in other scenes. We had no intention of trying to fake a performance, so we rewrote those scenes to give to other actors… The rest, we just didn't have him appear in those scenes. There's no digital manipulation or CG fabrication of any kind." One of the changed scenes saw the character of Plutarch sending Katniss a letter in prison, read by Haymitch, rather than coming himself to talk to her after her arrest for assassinating President Coin, explained as him being unable to see her for political reasons after her actions, which he nonetheless supports. On August 26, 2013, it was announced that actress Stef Dawson had joined the cast to portray Annie Cresta. Lionsgate announced on September 13, 2013, that Julianne Moore joined the cast to play President Alma Coin. The same month, Lily Rabe, Patina Miller, Mahershala Ali, Wes Chatham, and Elden Henson were announced to have joined the cast, to reprise their roles of Commander Lyme, Commander Paylor, Boggs, Castor, and Pollux, respectively. During this time, there was also a casting call for extras. Rabe subsequently had to leave the film due to a scheduling conflict with the 2014 Shakespeare in the Park production of Much Ado About Nothing. On April 4, 2014, it was announced that she would be replaced by Gwendoline Christie to portray Lyme. Filming scenes for District 2 at Berlin Tempelhof Airport in May 2014. Principal photography began on September 23, 2013, in Atlanta, and concluded on June 20, 2014, in Berlin, Germany; the two parts were filmed back-to-back. In October 2013, filming took place in Rockmart, Georgia. After the cast and crew took a break to promote The Hunger Games: Catching Fire, filming resumed on December 2, 2013. On December 14, 2013, shooting was held at the Marriott Marquis in Atlanta. On December 18, shooting began at Caldwell Tanks in Newnan, Georgia. Philip Seymour Hoffman died on February 2, 2014. He had completed filming his scenes for Part 1 and had a week left of shooting for Part 2; Lionsgate thereafter released a statement affirming that since the majority of Hoffman's scenes had been completed, the release date for Part 2 would not be affected. It was initially announced that Hoffman would be digitally recreated for a major scene involving his character that had not been shot, but Francis Lawrence later stated that he had rewritten Hoffman's two remaining scenes to compensate for the actor's absence, and there would be "no digital manipulation or CG fabrication of any kind". In a scene near the end of the film which was to have shown Plutarch speaking with Katniss in detention, Woody Harrelson's character instead reads her a letter from him. Filming in Atlanta completed in mid-April 2014, and production moved to Europe. On May 9, filming took place in Noisy le Grand, Paris. It is the same location where Brazil (1985) was filmed 30 years earlier. Toward the end of May, the cast and crew shot scenes at several locations in Berlin and Brandenburg, Germany. In Rüdersdorf, Brandenburg, the crew shot scenes for the portrayal of District 8 in an old cement factory. Hemsworth was injured on the set and was brought to a doctor in the Berlin borough Mitte. Scenes for District 2 were shot at Berlin Tempelhof Airport. Scenes for the underground approach on the Capitol were filmed in the Metropolitan Area Outer Underground Discharge Channel in Japan. A German casting agency sought 1,000 ethnically diverse extras (African, Asian, Southern-European, and Turkish) and "lived faces" to shoot scenes at the Babelsberg Film Studio. The film score was released on December 4, 2015. James Newton Howard returned to compose the film score; unlike the previous films in the series, there is no additional pop companion album with songs inspired by the film. Jennifer Lawrence performed "Deep in the Meadow", a lullaby that she sang in the first film. Along with the film's first teaser poster, Lionsgate released a teaser trailer on March 18, 2015, titled The Hunger Games Franchise Logo — Remember, featuring the transformation of the Mockingjay, along with notable quotes from the previous three movies, as well as a quote from the new film. The teaser was also played at screenings of Lionsgate's The Divergent Series: Insurgent. Scott Mendelson of Forbes noted the similarity of the teaser with that of The Dark Knight's (2008) teaser, which also features just an animated logo of the film and select dialogue. On June 1, a new teaser poster for the film, featuring a vandalised statue of President Snow, was revealed on the viral site TheCapitol.PN. On June 9, the teaser trailer for the film was released. A series of different posters, featuring the main cast with red Mockingjays painted on their faces, was released in July by Lionsgate. 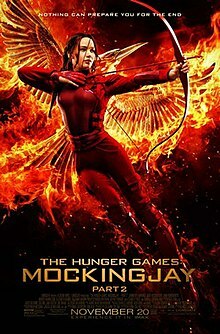 Later in July 2015, Lionsgate released a motion and teaser poster and propaganda video, followed by the film's official trailer. In August, a poster was released stating "100 days until The Hunger Games: Mockingjay - Part 2". However, it was taken down shortly thereafter, as the text on the poster appeared to resemble a swear word due to layout. However, another "bold and beautiful" poster was released depicting Katniss standing on the shoulder of a fallen President Snow statue. In October 2015, the first official clip and the final trailer were released, followed by the film's theatrical posters. In certain parts of Israel, the poster which depicted the image of Katniss (Lawrence) aiming her bow and arrow was removed over concerns her image would offend ultra-conservative Jewish audiences. Instead, a fiery mockingjay in the poster's background replaced Lawrence in marketing materials in multiple locations in Israel including Bnei Brak and West Jerusalem. Lionsgate did not comment on the Israeli marketing campaign. In Jerusalem, public posters with the image of a female are often torn down, while Bnei Brak does not allow posters with female images. The Hunger Games: Mockingjay – Part 2 premiered in Los Angeles, at the L.A. Live, complex on November 16, and in New York City on November 18. It premiered internationally in Berlin on November 4, in London November 5, in Paris November 9, in Madrid November 10, and in Beijing November 12. Due to the terrorist attacks in Paris on November 13, Lionsgate scaled down its L.A. premiere, cancelling press interviews on the red carpet (which was scheduled to last two hours). The stars mostly greeted fans and took a few photos before heading into the screening in Downtown Los Angeles. Mockingjay – Part 2 was released on November 20, 2015 in the United States and Canada. The film was originally scheduled to be released in 2D, Digital 3D, RealD 3D, and IMAX 3D, which would have made it the only film of the series to be globally released in 3D formats; the previous film was released in 3D in China. It is the third film in the franchise to be released in IMAX, following the first and the second film with the exception of the third film. However, the decision to release the film in 3D and IMAX 3D in North America was revoked. Director Francis Lawrence discussed the decision, stating, "I love the 3D format and I know that Mockingjay Part 2 will play perfectly in 3D and 2D internationally – but I'm pleased that we're maintaining the 2D only (and IMAX) formats domestically. It is the best of all worlds!". It was nevertheless released in 3D formats in overseas markets, including China. The film was also released in the Dolby Vision format in Dolby Cinemas, which is the first ever for Lionsgate. Internationally, it was released day-and-date across 87 countries, starting from November 18, in certain markets like Belgium, Brazil, France and the Netherlands and on November 19 in Australia, Germany, Russia, Italy, and the United Kingdom, followed by China, Mexico, Japan, the United States, Canada, and 19 other markets, on November 20, as part of the biggest movie rollout ever by Lionsgate. The only big territories where the film did not open on the same weekend are Spain, Greece and India, which released the movie on November 27. The Hunger Games: Mockingjay – Part 2 fell short of expectations at the box office. It grossed a total of $281.7 million in the USA & Canada and $371.7 million in other countries for a worldwide total of $653.4 million. Its worldwide opening of $247.2 million is the twenty-seventh-biggest of all time. It is the lowest-grossing film in The Hunger Games film series, and the ninth highest-grossing film of 2015, Lionsgate's co-chairman Rob Friedman blamed the impact of the November 2015 Paris attacks as well as Star Wars: Episode VII – The Force Awakens for the film's underwhelming performance in certain European countries and in the U.S. and Canada, further blaming the latter for cutting the film's North American gross by as much as $50–100 million. However, according to Deadline Hollywood, this is untrue given how Mockingjay – Part 2 had the lowest opening among the series and was already grossing behind Mockingjay – Part 1 by $32.7 million or 12% before The Force Awakens even opened. Deadline also stated that the November attacks in Paris did not noticeably affect the European release of Mockingjay — Part 2. In China the film notably grossed a disappointing $21.5 million, which the studio blamed on the competition with The Martian and Spectre, along with Taiwanese film Our Times. Deadline Hollywood calculated the net profit of the film to be $134.3 million, when factoring together all expenses and revenues for the film. In North America, according to pre-release trackings, The Hunger Games: Mockingjay – Part 2 was initially projected to earn around $120–125 million in its opening weekend. However, estimates decreased to a mid-$110 million range once the film approached its opening day. It made $16 million from its Thursday night preview which is the lowest among the franchise but the third-biggest of 2015, and $45.5 million on its opening day. In its opening weekend, the film grossed $102.7 million, finishing first at the box office but falling below expectations and becoming the lowest opening among the franchise. Sources attributed the franchise-low opening to heavy winter weather hitting areas such as South Dakota, Michigan, and Chicago as well as Lionsgate's decision to split the last novel into two separate pictures. Still, it is the fourth film in the Hunger Games film series to open with more than $100 million, and 2015's sixth-biggest opening, behind Star Wars: The Force Awakens, Jurassic World, Avengers: Age of Ultron, Furious 7, and Minions. IMAX comprised $8.5 million of the opening gross from 384 IMAX locations. The below-expectations opening of the film led to the decline of Lionsgate stock the day after its opening weekend. The film retained the top spot at the box office in the second weekend, declining 49.3% and grossing $52 million. It topped the box office for the third consecutive weekend despite facing competition with the animated movie The Good Dinosaur and the horror comedy Krampus in its second and third weekend, respectively. In total, it held the No. 1 spot in the North American box office for four consecutive weekends (even after facing competition with In the Heart of the Sea in its fourth weekend), becoming the first film since Furious 7 to top the box office for four straight weekends and the second film in The Hunger Games film series after 2012's The Hunger Games to achieve this feat. Mockingjay – Part 2 grossed a total of $281 million, 17% less than Mockingjay – Part 1 and is also the lowest when compared with the two other films in the series. Outside North America, the film was released in a total of 92 countries. It was projected by many box office analysts to surpass the openings of all the previous Hunger Games film, considering it was the last installment, and that its release date was the same in 87 markets, including China (the latter being a rare phenomenon). It was projected to gross around $165–185 million. However, it ended up earning $144.5 million across 32,500 screens from 87 markets opening at No. 1 in 81 of them. The underperformance was attributed to the 2015 Paris terror attacks which affected many parts of Europe, and the rising value of the U.S. dollar. Earning $62 million (down 57%) and $30.05 million (down 49%) in its second and third weekend, respectively, it topped the international box office for four consecutive weekends. The United Kingdom posted the highest opening with $17.1 million followed by China with $15.8 million, Germany ($15 million), Mexico ($8.9 million) France ($7.1 million), Australia ($6.8 million), Brazil ($6.8 million), Russia ($6.7 million), Venezuela ($5.6 million), and Italy ($4.3 million). In China, it opened at No. 1 despite facing competition with Taiwanese film Our Times, and the continued run of Spectre and having an underperforming opening. It fell precipitously by 88.6% in its second weekend, which is the worst second-weekend drop for any major Hollywood release in China of 2015. Notably in France, the opening was above expectations considering cinemagoers being affected by the Paris terror attacks and the heightened state of alert in Belgium at that time. It topped the United Kingdom and Ireland box office for four consecutive weekends which is a rare achievement and thereby becoming the first film since Les Misérables in 2013 to have four straight weeks of win at the UK box office. It is the highest-grossing film of 2015 in Colombia with $36 million. In terms of total earnings its largest markets are Germany ($43.7 million) and the United Kingdom ($43.1 million), and Colombia ($36 million). The Hunger Games: Mockingjay – Part 2 received generally positive reviews from critics, with praise for action sequences and performances but criticism for splitting the book into two separate adaptations. On review aggregation website Rotten Tomatoes, the film has an approval rating of 70%, based on 274 reviews, with an average rating of 6.49/10. The website's critical consensus reads, "With the unflinchingly grim Mockingjay Part 2, The Hunger Games comes to an exciting, poignant, and overall satisfying conclusion." On Metacritic, the film has a weighted average score of 65 out of 100, based on 44 critics, indicating "generally favorable reviews". Audiences polled by CinemaScore gave the film an average grade of "A–" on an A+ to F scale. Lawrence, Hutcherson, and Sutherland received praise for their performances. The supporting cast's performances, particularly Harrelson, Claflin, and Malone's, were also highly praised, but critics felt their appearances were too brief. Several critics also commented on the film's dark tone, even by comparison to its predecessors. Manohla Dargis from The New York Times praised Lawrence's character saying, "Katniss is the right heroine for these neo-feminist times." Stephen Whitty from New York Daily News said, "'Remember that line from the first 'Hunger Games' film: "May the odds be ever in your favor"? Yeah, well, that luck has run out'." Leah Greenblatt of Entertainment Weekly remarked, "With its political power struggles and prodigious body count, all rendered in a thousand shades of wintry greige, the movie feels less like teen entertainment than a sort of Hunger Games of Thrones." Robbie Collin awarded the film four out of five stars and called the film "scorchingly tense". In his review for The Telegraph, he praised the film for "being intense" and lauded the performances of Lawrence and Hoffman." Benjamin Lee, writing for The Guardian, felt that "the decision to split the final chapter of the dystopian saga into two chapters looms large over a frustratingly-paced mixture of thrilling action and surprisingly dark drama." He praised Jennifer Lawrence's acting and Francis Lawrence's direction and commented, "The decision to turn a 390-page book into over four hours' worth of screen time (and a bonus payday) has resulted in a patchy end to a franchise that started so promisingly." Tom Huddleston of Time Out gave the film four out of five stars. He praised the ending of the film as "genuinely powerful", and commented that "this might be the most downbeat blockbuster in memory, a film that starts out pitiless and goes downhill from there, save for a fleeting glimmer of hope in the final moments. It's a bold statement about the unforgiving nature of war, unashamedly political in its motives and quietly devastating in its emotional effect." On August 8, 2017, Variety reported that Lionsgate CEO Jon Feltheimer has interest in having spinoffs made for The Hunger Games, and wants to create a writers room to explore the idea. When asked about the idea of Hunger Games spinoffs, Jennifer Lawrence said "I think it's too soon. They've got to let the body get cold, in my opinion." ^ a b "Exclusive: The Hob Interviews Frances Lawrence, Nina Jacobson & Jon Kilik at World Premiere". The Hob. November 13, 2013. Archived from the original on November 14, 2013. Retrieved January 14, 2014. ^ "THE HUNGER GAMES: MOCKINGJAY - PART 2 [2D] (12A)". British Board of Film Classification. October 26, 2015. Retrieved October 26, 2015. ^ Sandwell, Ian (October 5, 2015). "The Hunger Games: Mockingjay - Part 2's running time is NOT 147 minutes". Digital Spy. ^ Verhoeven, Beatrice (November 20, 2015). "'Hunger Games: Mockingjay – Part 2' Crushes Competition With $16 Million at Thursday Box Office". TheWrap. Retrieved April 15, 2016. ^ a b c d "The Hunger Games: Mockingjay – Part 2 (2015)". Box Office Mojo. Retrieved April 1, 2016. ^ a b ""Mockingjay" Movie Starts Filming In Atlanta; Jennifer Lawrence, Liam Hemsworth Spotted On "The Hunger Games" Set". ibtimes.com. September 24, 2013. Retrieved January 14, 2014. ^ a b Mike Fleming Jr (March 22, 2016). "No. 12 'The Hunger Games: Mockingjay Part 2' – 2015 Most Valuable Movie Blockbuster Tournament". Deadline Hollywood. Retrieved March 23, 2016. ^ Polowy, Kevin (November 24, 2015). "'Mockingjay' Director Breaks Down the Performances of Jennifer Lawrence's Young Nephews". Yahoo! Movies. Retrieved April 15, 2019. ^ "'Mockingjay' to be split into two movies, release dates announced". EW.com. July 10, 2012. Retrieved October 27, 2012. ^ "Exclusive: Francis Lawrence to Direct Remainder of The Hunger Games Franchise with Two-Part Adaptation of Mockingjay". Collider.com. November 1, 2012. ^ "Francis Lawrence: Directing 'Mockingjay' was like 'wrangling puppies'". Dave Lewis. November 22, 2014. Retrieved December 1, 2015. ^ Busis, Hillary (December 6, 2012). "Best of 2012 (Behind the Scenes): 'Game Change' (and 'Mockingjay') writer Danny Strong on his biggest year". Entertainment Weekly. Retrieved January 21, 2013. ^ Kit, Borys (February 15, 2013). "'Hunger Games: Mockingjay' Screenwriter Danny Strong to Begin Work on Part 2 (Exclusive)". The Hollywood Reporter. Retrieved May 2, 2013. ^ "Liam Hemsworth Talks 'Mockingjay,' Confirms Filming Starts September". Mockingjay.net. August 5, 2013. Retrieved August 18, 2013. ^ "'Hunger Games: Mockingjay' to begin production in September". digitalspy.co.uk. April 8, 2013. Retrieved September 5, 2013. ^ Meza, Ed (December 22, 2014). "Studio Babelsberg Braces for $3 Million Annual Loss". Variety. Retrieved April 8, 2016. ^ Anthony D'Alessandro (November 23, 2015). "Katniss Looks To Thrive During Holidays; 'Night Before' & 'Secret In Their Eyes' Try To Survive – B.O. Postmortem". Deadline Hollywood. Retrieved November 25, 2015. ^ "The Hunger Games: Mockingjay – Part 2 Ccast and crew". Fandango. Retrieved November 30, 2015. ^ a b Fleming Jr, Mike (April 4, 2014). "'Game Of Thrones' Actress Gwendoline Christie Replacing Lily Rabe In 'Hunger Games'". deadline.com. Retrieved April 4, 2014. ^ Stewart, Andrew (February 2, 2014). "Philip Seymour Hoffman Was Nearly Finished Shooting 'Hunger Games'". Variety. Retrieved February 26, 2014. ^ O'Hara, Helen (October 28, 2014). "Will There Be More Hunger Games After Mockingjay Part 2?". Empire. Retrieved August 3, 2015. ^ O'Connell Sean (March 1, 2015). "How Philip Seymour Hoffman's Death Changed The Hunger Games". Cine Blend. Retrieved December 1, 2015. ^ Ford, Rebecca (August 26, 2013). "Australian Actress Stef Dawson Joins 'The Hunger Games: Mockingjay'". The Hollywood Reporter. Retrieved November 29, 2015. ^ "Julianne Moore Joins 'The Hunger Games'". deadline.com. September 13, 2013. Retrieved January 14, 2014. ^ "Lily Rabe Joins 'Hunger Games: Mockingjay' Pics". deadline.com. September 16, 2013. Retrieved January 14, 2014. ^ "Broadway's Patina Miller Joins 'Hunger Games: Mockingjay 1 & 2'". deadline.com. September 18, 2013. Retrieved November 29, 2015. ^ "Wes Chatham, Elden Henson Join 'The Hunger Games: Mockingjay' Films". deadline.com. January 14, 2014. Retrieved November 29, 2015. ^ Wilkinson, Amy (September 20, 2013). "'Mockingjay' Recruits Mahershala Ali As Boggs". Hollywood Crush. MTV. Retrieved November 29, 2015. ^ "A new 'Mockingjay' casting call for extras". accessatlanta.com. September 23, 2013. Archived from the original on September 29, 2013. Retrieved January 14, 2014. ^ Purcell, Carey (June 15, 2014). "Lily Rabe on Swamp Creatures, Choosing Shakespeare Over "The Hunger Games" and Avoiding Spoilers". playbill.com. Retrieved November 21, 2014. ^ "Lily Rabe was originally cast to play the role of Commander Lyme". londonfilmpremieres.com. londonfilmpremieres. Retrieved September 30, 2015. ^ Setoodeh, Ramin (May 18, 2014). "CANNES: Jennifer Lawrence Dances and Sings at 'Hunger Games' Party". Variety. Retrieved August 27, 2014. ^ Christine (October 23, 2013). ""The Hunger Games: Mockingjay" filming in Rockmart, GA this week". onlocationvacations.com. Retrieved November 20, 2014. ^ Christine (December 14, 2013). ""The Hunger Games: Mockingjay" seems to be filming at the Marriott Marquis in Atlanta tonight". onlocationvacations.com. Retrieved November 20, 2014. ^ Hartsell, Bradley (December 19, 2013). ""Hunger Games 3" Begins Filming At Caldwell Tanks". times-herald.com. Archived from the original on January 11, 2014. Retrieved January 14, 2014. ^ Celona, Larry; Golding, Bruce (February 2, 2014). "Philip Seymour Hoffman found dead with needle in arm: cops". New York Post. Retrieved February 2, 2014. ^ Sullivan, Kevin P. (February 2, 2014). ""Hunger Games" Studio Reacts To Philip Seymour Hoffman Death". MTV. Retrieved February 3, 2014. ^ O'Neil, Natalie (February 6, 2014). ""Hunger Games" to digitally recreate Hoffman". New York Post. Retrieved February 7, 2014. ^ Lussier, Germain (February 7, 2014). "Philip Seymour Hoffman's Work In "The Hunger Games: MockingJay Part 2" Will Be Finished Digitially". /Film. Retrieved February 7, 2014. ^ "Will There Be More Hunger Games After Mockingjay Part 2?". Empire Online. October 28, 2014. Retrieved April 19, 2015. ^ Daniell, Mark (November 18, 2015). "How Philip Seymour Hoffman's death changed 'Mockingjay — Part 2'". Toronto Sun. Retrieved December 13, 2015. ^ "Just wrapped Atlanta tweet by Just wrapped Atlanta". twitter.com. Retrieved April 22, 2014. ^ "Off to Europe! tweet by Francis Lawrence". twitter.com. Retrieved April 22, 2014. ^ Berwah, Tanvi (April 19, 2014). ""Mockingjay" filming wraps up in Atlanta; crew headed to Europe now". hunger-games.net. Archived from the original on April 6, 2016. Retrieved April 22, 2014. ^ Prosser, Caroline (May 10, 2014). "Jennifer Lawrence prepares her bow and arrow as Hunger Games filming continues in Paris". dailymail.co.uk. Retrieved May 25, 2014. ^ Flo (May 9, 2014). "Tournage d'Hunger Games 3 à Noisy le Grand". filmgeek.fr (in French). Retrieved November 20, 2014. ^ Carina Parke; Ronja Brier. "Liam Hemsworth Hollywood-Star humpelt zum Doc" (in German). Bild.de. Retrieved November 20, 2014. ^ "Dreharbeiten auf dem Tempelhofer Feld" (in German). Berliner-Zeitung.de. Retrieved November 20, 2014. ^ ""Tribute von Panem" in Babelsberg - 1000 Komparsen gesucht" (in German). Morgenpost.de. Retrieved June 3, 2014. ^ "the-hunger-games-mockingjay-part-2-soundtrack-album-cover-and-tracklist-unveiled-pre-order-now". Getmusicasia. November 23, 2015. Archived from the original on November 24, 2015. Retrieved November 30, 2015. ^ "What's On The 'Mockingjay, Part 2' Soundtrack? It's Full Of New Music From Panem". Sage Young. Bustle.com. November 23, 2015. Retrieved December 1, 2015. ^ "Jennifer Lawrence Just Released a Brand New Song for the Hunger Games". Ella Ceran. teenvogue.co. November 23, 2015. Retrieved December 1, 2015. ^ "How Hunger Games Director 'Coaxed' Jennifer Lawrence to Record Another Song for Mockingjay — Part 2". Vulture.com. November 19, 2015. Retrieved December 1, 2015. ^ Jeff Labrecque (March 17, 2015). "Exclusive: See the final Hunger Games film's teaser poster, the first spark of Mockingjay -- Part 2". Entertainment Weekly. Retrieved March 19, 2015. ^ Ashley Lee (March 18, 2015). "Watch the 'Hunger Games: Mockingjay, Part 2' Logo, Echoing All the Franchise's Highs (Video)". The Hollywood Reporter. Retrieved March 19, 2015. ^ Scott Mendelson (March 18, 2015). "'Hunger Games: Mockingjay Part 2' Teaser Trailer Mimics 'Dark Knight' Teaser Share". Forbes. Retrieved March 19, 2015. ^ "THECAPITOL.PN HACKED BY THE REBELS WITH NEW POSTER IMAGE OF RUINED SNOW STATUE". Quarter Quell. June 1, 2015. Retrieved June 1, 2015. ^ Mannie Holmes (August 14, 2015). "'The Hunger Games' Poster Accidentally Drops Expletive". Variety. Retrieved January 1, 2016. ^ "New 'Hunger Games: Mockingjay - Part 2' poster shows President Snow statue crushed - Tech Insider". Tech Insider. August 26, 2015. ^ Bryant, Jacob. "Watch: Panem Goes to War in Final 'Hunger Games: Mockingjay – Part 2' Trailer". Variety. Retrieved October 13, 2015. ^ Watercutter, Angela. "The New Hunger Games Poster Is Full of Hidden Messages". Wired. Retrieved October 13, 2015. ^ Bui, Hoai-Tran. "The final 'The Hunger Games: Mockingjay — Part 2' poster is FIRE". USA Today. Retrieved October 13, 2015. ^ Etan Vlessing (November 20, 2015). "Jennifer Lawrence Removed From 'Hunger Games: Mockingjay 2' Posters in Israel". =The Hollywood Reporter. Retrieved November 22, 2015. ^ Ali Jafaar (November 20, 2015). "Jennifer Lawrence Dropped From 'Mockingjay' Posters In Israeli Cities". Deadline Hollywood. Retrieved November 22, 2015. ^ a b Rebecca Ford (November 15, 2015). "'Hunger Games: Mockingjay' L.A. Premiere Scales Back Due to Paris Attacks". The Hollywood Reporter. Retrieved November 16, 2015. ^ Devan Coggan (November 15, 2015). "The Hunger Games: Mockingjay - Part 2 cancels red carpet interviews in wake of Paris attacks". Entertainment Weekly. Retrieved November 16, 2015. ^ Dave McNarry (November 15, 2015). "'Mockingjay Part 2' L.A. Premiere Cancels Interviews After Paris Attacks". Variety. Retrieved November 16, 2015. ^ "Die Tribute Von Panem – Mockingjay Teil 2 feiert Weltpremiere in Berlin!". DigitaleLeinwand.de. September 14, 2015. ^ Scott Mendelson (January 6, 2015). "Hunger Games' Goes To China In 3D". Forbes. Retrieved May 7, 2015. ^ Etan Vlessing (February 6, 2015). "'The Hunger Games: Mockingjay, Part 2' To Get Imax 3D Release". The Hollywood Reporter. Retrieved February 6, 2015. ^ Carolyn Giardina (November 16, 2015). "'Star Wars' Dolby Cinema Release Could Push Forward the New Format". The Hollywood Reporter. Retrieved November 17, 2015. ^ Etan Vlessing (October 15, 2015). "'The Hunger Games: Mockingjay — Part 2' Sets China Release Date". The Hollywood Reporter. (Prometheus Global Media). Retrieved October 16, 2015. ^ a b Brent Lang (November 19, 2015). "Box Office: 'Hunger Games' Eyes Ravenous $300 Million Global Debut". Variety. Retrieved November 20, 2015. ^ Samantha Highfill (January 25, 2016). "The Hunger Games: Mockingjay - Part 2 sets home-video release dates". Entertainment Weekly. Retrieved January 25, 2016. ^ Thomas K. Arnold (March 30, 2016). "'The Hunger Games: Mockingjay – Part 2' Debuts Atop Disc Charts". Variety. Retrieved June 30, 2016. ^ Ryan Faughnder (March 23, 2016). "'Hunger Games' studio Lionsgate faces a challenge as its young-adult films lose their appeal". Los Angeles Times. Retrieved March 23, 2016. ^ "WORLDWIDE OPENINGS". Box Office Mojo. Retrieved November 22, 2015. ^ "THE HUNGER GAMES". Box Office Mojo. Retrieved February 7, 2016. ^ "2015 WORLDWIDE GROSSES". Box Office Mojo. Retrieved February 7, 2016. ^ a b Anita Busch (February 5, 2016). "Lionsgate Plans 17 Films For 2017, Says 'Star Wars' Grabbed $50M-$100M From 'Mockingjay 2'; Stock Falls 27%". Deadline Hollywood. Retrieved February 6, 2016. ^ Anthony D'Alessandro (February 5, 2016). "'Star Wars: The Force Awakens' Reaches Unprecedented Height At Domestic B.O. With $900M, $2B Worldwide". Deadline Hollywood. Retrieved February 6, 2016. ^ Scott Roxborough (March 22, 2016). "Brussels Attacks: City Cinemas Close Following Twin Bombings". The Hollywood Reporter. Retrieved March 23, 2016. ^ Etan Vlessing (February 5, 2016). "Lionsgate Stock Plunges After 'Mockingjay 2' Disappoints". The Hollywood Reporter. Retrieved February 6, 2016. ^ Brent Lang (November 16, 2015). "'Hunger Games' Finale Eyes Massive $125 Million Debut". Variety. Retrieved November 17, 2015. ^ Pamela McClintock (November 18, 2015). "Box-Office Preview: 'Hunger Games: Mockingjay 2' Targets $120M-$125M in U.S." The Hollywood Reporter. Retrieved November 19, 2015. ^ Pamela McClintock, Rebecca Ford (November 20, 2015). "Box Office: 'Hunger Games: Mockingjay' Pacing Friday for Franchise-Low $110M U.S. Debut". The Hollywood Reporter. Retrieved November 21, 2015. ^ Anthony D'Alessandro (November 20, 2015). "'Mockingjay – Part 2' Flying To $104M-$110M, Lowest In 'Hunger Games' Series But Still Great Business". Deadline Hollywood. Retrieved November 21, 2015. ^ Scott Medelson (November 20, 2015). "Box Office: 'Hunger Games: Mockingjay 2' Scores Okay $16M Thursday". Forbes. Retrieved November 21, 2015. ^ D'Alessandro, Anthony. "'Mockingjay – Part 2' Flying To $104M-$110M, Lowest In 'Hunger Games' Series But Still Great Business". Deadline Hollywood. Retrieved November 20, 2015. ^ "Box Office Top 20: Final 'Hunger Games' movie opens on top". Associated Press. November 23, 2015. Retrieved November 23, 2015. ^ a b Anthony D'Alessandro (November 22, 2015). "Was It Wise To Divide Up 'Mockingjay'? Finale's $102.4M Debut Is 5th Highest Of 2015, But Lowest In Series". Deadline Hollywood. Retrieved November 22, 2015. ^ a b Pamela McClintock (November 22, 2015). "Box Office: Final 'Hunger Games' Opens to Series-Low $101M in U.S.; Earns $247M Globally". The Hollywood Reporter. Retrieved November 22, 2015. ^ Etan Vlessing (November 23, 2015). "Lionsgate Stock Down Slightly After Final 'Hunger Games' Debut, Analysts Weigh In". The Hollywood Reporter. Retrieved November 23, 2015. ^ "Box Office Top 20: 'Mockingjay _ Part 2' tops 'The Good Dinosaur,' 'Creed'". Associated Press. November 30, 2015. Retrieved December 2, 2015. ^ "'Hunger Games' Finale Fends Off Spooky 'Krampus' Flick". Associated Press. December 8, 2015. Retrieved December 8, 2015. ^ Brad Brevet (December 13, 2015). "'In the Heart of the Sea' Runs Ashore Giving 'Mockingjay 2' Its Fourth Straight #1". Box Office Mojo. Retrieved December 14, 2015. ^ Ryan Faughnder (February 5, 2016). "Lionsgate stock plummets after 'Mockingjay 2' drives disappointing earnings". Los Angeles Times. Retrieved February 6, 2016. ^ a b Nancy Tartaglione (November 29, 2015). "'Mockingjay' Rules Roost; 'Good Dinosaur' Hatches With $29M; 'The Martian' Lands $50M In China – Intl Box Office". Deadline Hollywood. Retrieved November 30, 2015. ^ a b Nancy Tartaglione (December 8, 2015). "Holdovers Top Chart; 'Heart Of The Sea', 'Point Break' See Small Swells – Intl B.O. Final". Deadline Hollywood. Retrieved December 9, 2015. ^ a b c d Nancy Tartaglione (November 24, 2015). "'Mockingjay' Lands At $144.5M As China & Caution In Europe Squeeze Hwd – Intl B.O. Final". Deadline Hollywood. Retrieved November 25, 2015. ^ Dave McNarry (November 25, 2015). "'Hunger Games: Mockingjay — Part 2' Soars to $300 Million Worldwide". Variety. Retrieved November 26, 2015. ^ Ben Fritz (November 22, 2015). "'Mockingjay Part 2' Has Lowest Box-Office Opening of 'The Hunger Games' Series". The Wall Street Journal. Retrieved November 22, 2015. ^ Nancy Tartaglione (December 13, 2015). "Katniss Retakes No. 1 From China 'Surprise', 'Good Dinosaur' In 3rd, 'Sea', 007 Round Out Top 5 – Intl Box Office Final". Deadline Hollywood. Retrieved December 15, 2015. ^ Jonathan Papish (December 7, 2015). "'Martian,' 'Point Break' Deliver 1-2 Import Punch to Four New Chinese Films". China Film Insider. Retrieved December 8, 2015. ^ "The Hunger Games: Mockingjay – Part 2 (International Results)". Box Office Mojo. Retrieved April 3, 2016. ^ Charles Gant (January 12, 2016). "The Hateful Eight shoots up UK box office despite standoff over screenings". The Guardian. Retrieved January 13, 2016. ^ Agustin Mango (February 13, 2016). "Latin America's Film Industry Paradox: 5 Countries With Loud Fest Titles (and Quiet Box Office Payoffs)". The Hollywood Reporter. Retrieved February 13, 2016. ^ Nancy Tartaglione (January 3, 2016). "'Star Wars', Local-Language & Family Pics Lead; 'Sherlock' Shines In Korea – Intl B.O." Deadline Hollywood. Retrieved January 4, 2016. ^ "The Hunger Games: Mockingjay – Part 2 — International Totals". Box Office Mojo. Retrieved February 13, 2016. ^ Brown, Tracy (November 21, 2015). "Katniss is the best reason to stick with 'The Hunger Games: Mockingjay -- Part 2,' reviews say". Los Angeles Times. Retrieved November 22, 2015. ^ a b "The Hunger Games: Mockingjay — Part 2 (2015)". Rotten Tomatoes. Fandango Media. Retrieved December 13, 2015. ^ a b "The Hunger Games: Mockingjay — Part 2 Reviews". Metacritic. CBS Interactive. Retrieved November 24, 2015. ^ D'Alessandro, Anthony (November 20, 2015). "'Mockingjay – Part 2' Racks Up $16M In Thursday Night Previews; Current Global B.O. At $43M". Deadline Hollywood. Penske Business Media. Retrieved November 21, 2015. ^ Dargis, Manohla (November 19, 2015). "Review: 'The Hunger Games: Mockingjay Part 2,' Katniss's Final Battle". The New York Times. ISSN 0362-4331. Retrieved December 1, 2015. ^ Whitty, Stephen. "'Hunger Games: Mockingjay — Part 2' is boring". New York Daily News. Retrieved December 1, 2015. ^ Greenblatt, Leah (November 4, 2015). "The Hunger Games: Mockingjay—Part 2: EW review". Entertainment Weekly. Time. Retrieved November 10, 2015. ^ Collin, Robbie (November 19, 2015). "The Hunger Games: Mockingjay - Part 2 review: 'scorchingly tense'". The Telegraph. Telegraph Media Group. Retrieved November 29, 2015. ^ Lee, Benjamin (November 5, 2015). "The Hunger Games: Mockingjay - Part 2 review: Jennifer Lawrence drags franchise through final round". The Guardian. Guardian News and Media. Retrieved November 29, 2015. ^ Huddleston, Tom (November 5, 2015). "The Hunger Games: Mockingjay - Part 2". Time Out. Time Out Group. Retrieved November 29, 2015. ^ Briones, Isis. "Even More Nominations for the 2016 Teen Choice Awards Are Here". Teen Vogue. Retrieved June 12, 2016. ^ Lang, Brent (August 8, 2017). "Lionsgate Chief Says 'Hunger Games,' 'Twilight' Have 'More Stories to Tell'". Variety. Retrieved January 30, 2018. ^ Lang, Brent (December 14, 2015). "Jennifer Lawrence on 'Hunger Games' Prequels: 'It's Too Soon'". Variety. Retrieved January 30, 2018. This page was last edited on 16 April 2019, at 07:12 (UTC).